Description: This very talented little poodle plays a merry little tune for his master when pulled. His musical cart has a 3-note xylophone. 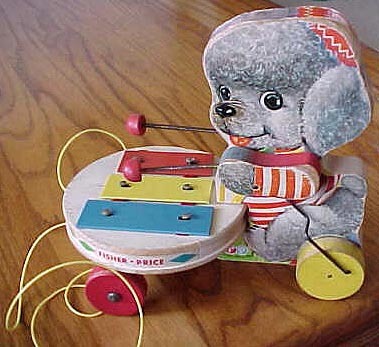 When pulled, the xylophone platform pivots from side to side while Fido swings his arms to strike the keys with his mallots. FPT4361 - Wooden cut-out dog with paper lithographs on both sides of a grey poodle wearing a red cap and a red and white striped shirt. The dog has 2 seperate wooden arms with paper lithographs on both sides of red and white striped sleeves and grey dog hands. Each arm has an attached mallet with a red bead on the end. The dog is "sitting" on a seat that is attached to a round wooden platform on the front. The platform has 3 colored metal xylophone keys on the top (large blue, medium yellow, and small red). The edges of the platform have white paper lithographs with multi-colored diamond shapes and the words "Fisher-Price" in red. When pulled, the xylophone platform pivots from side to side while the dog swings his arms to strike the keys with his mallots. Rolls on 4 wooden wheels, 2 under the xylophone platform and two under the dog. Measures 8-5/8" long, 8" high, and 5" wide. 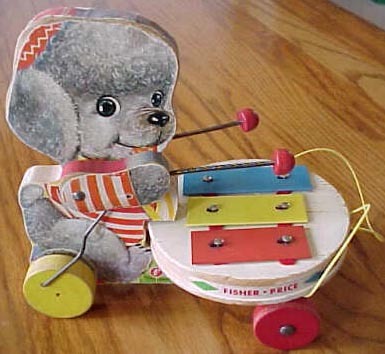 Also see similar toys: 1955-1958's #707 Fido Zilo, 1958-1960's #737 Ziggy Zilo, and 1960-1962's #738 Shaggy Zilo.